“By Crom!” Today is the last day to pre-order Super7's amazing new Conan the Barbarian deluxe action figure!!! Charging off the pages of the original 1970’s comic books, this epic Conan the Barbarian deluxe figure comes with spear, sword, dagger, and necklace accessories plus an alternate head. The Conan the Barbarian action figure is a 7” tall, highly articulated and fully poseable action figure sculpted by the Four Horsemen. 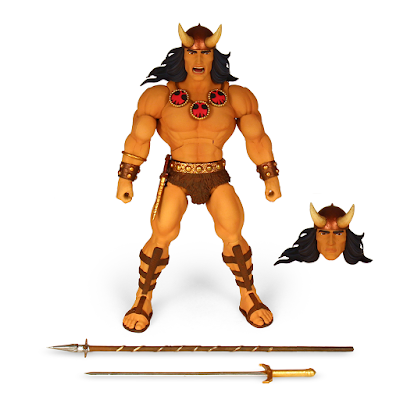 The Conan the Barbarian Deluxe Action Figuyre is a made-to-order release for $35 at the Super7 online store. But get your orders in ASAP as the window to pre-order this figure ends on April 1, 2019.